Notes: Developed by Cal Bird around 1955 on the banks of Burney Creek. 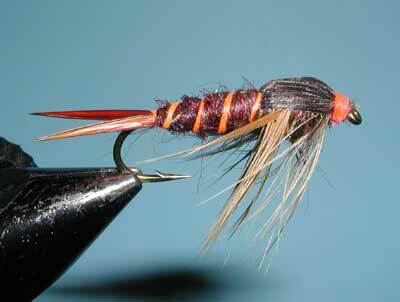 The fly was marketed by Dan Bailey of Montana and has remained a popular pattern for over 50 years. Cal owned and operated a flyshop in downtown San Francisco and moved to the Reno area in the 1970's to spend the last 25 years of his life fishing his favorite waters of the Truckee and Tahoe area. Cal passed away in 1999. He was reknowned as a fly tier with creative patterns that remain popular. His other contributions include the Bird's Nest, Bird's Caddis, and Bird's Stone. Bird's Stonefly Nymph fly is a simple pattern which has proved very effective for stonelfies within the Sierran Streams. The recipe was one which Andy Burk, a close friend of Cal, reported in the April 2004 issue of California Flyfisher. It is an effective Salmonfly nymph in sizes #4-8. Salmonfly nymphs will inhabit the stream for 2-4 years and migrate once the water warms to about 50 degrees. The migration will start on the lower reaches of the stream and will work upstream. The nymphs will move during the late afternoon and early evening from the riffles to the shallows and eddies of the shore. During the night, they will crawl onto the rocks and foliage along the stream to emerge from their shucks. During this 4-5 day migration, nymphs often become dislodged into the current. Use a drag-free drift along the feeding lanes. The fly needs to have enough weight to bounce along the bottom.